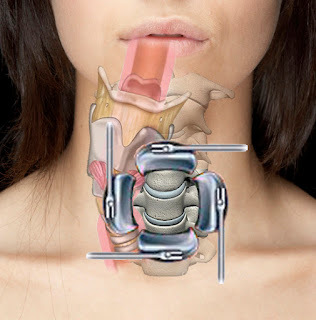 It is not unusual for an ENT surgeon to see patients with swallowing and voice difficulties after cervical spine surgery. In particular, the ACDF surgery (Anterior Cervical Discectomy and Fusion). The key to understanding these issues is to first understand the anatomy involved. The cervical spine is located in the back of the neck. In front of this spine is the esophagus (swallowing tube) and voicebox. As such, when a spine surgeon goes through the FRONT of the neck in order to perform cervical spine surgery located in the BACK of the neck, (s)he has to move the esophagus and voicebox over to the side. A plate is than fixated to the spine to fuse the cervical vertebral bodies. 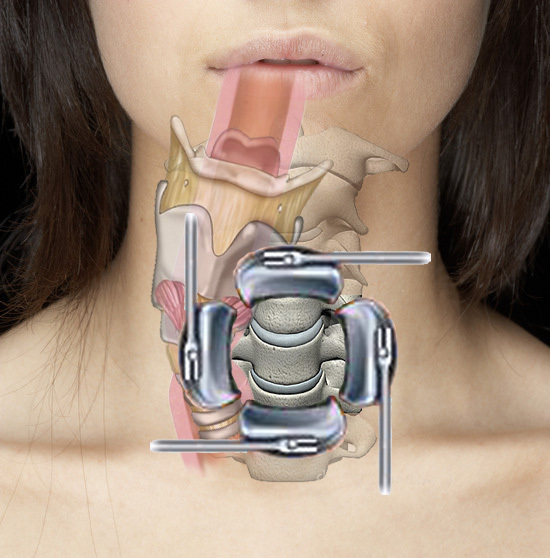 Because of such manipulation of the esophagus and voicebox, it is not uncommon for a patient to complain of hoarseness and difficulty swallowing after surgery. Watch the video describing ACDF and how it can affect voice and swallow. Definitely great knowledge with awesome video. Thanks for posting. I had cervical surgery and my speech was slurred afterwards. Did anyone else have speech problems after this surgery? I probably should not have had this surgery. Neurologist did not recognize that I was in the beginning stages of ALS. I really would like to know if any other disease mimics ALS. I had this procedure done exactly 15 days ago and I still don't have a voice. In fact I've been off of pain meds after first week out of surgery. No pain whatsoever.I find the lack of any soreness or pain in my throat or neck coupled with not having s voice very odd. I'll admit, I didn't get realistic recovery times but I know my body, something's not right. When I complained it was blamed on inflammation so they gave me the methylprednisolone burst; didn't change a thing. So now they have me scheduled to see a ENT specialist. I hope nothing went wrong but if there was damage to my larynx can it be repaired? Harrison311: I had surgery on May 9th and am experiencing the same thing. Have you got your voice back? Did the ENT help you? I'm scheduled to see one as well. I've had 4 cervical fusions C3-C7 in 3 separate surgeries (they were very successful). I experienced voice issues each time which resolved. The swallowing continues to be problematic. After the 2nd surgery (2 fusions at the same time) there was significant swallowing and breathing issues which required a re-admission less than 20 day post discharge. After the last fusion, the surgeon mentioned that he had to remove significant scar tissue at the site. I must cut my portions very small and chew thoroughly with frequent sips of liquids to get food down. Small foods, i.e. rice often get 'stuck'. Very good to see information on this problem. With thanks to a friend who is a speech pathologist doing research on cervical fusions and it's relationship to speech and swallowing issues who shared this article with me. I'm 40 days post op on a C4 - C6 ACDF procedure. Sometimes the swallow reflex is still not quite right. I'm more concerned about my vocal range being limited as it has. Most of my vocal rage has almost returned to pre-op conditions.There are a couple of notes that have been lost. Hopefully a little more time and I can recover my full range. Hang in there folks. It comes back. My Dr. told me that higher up in the C-spine (above C4) is when the voice box and esophagus get a little more tweaked and is prone to be a little more involved. I guess I will find out soon enough because I'll probably be getting those done too. I had cervical fusion c3-c6 May of 2013.I still have a very weak voice and some swallowing problems.The ENT doctor told me a month ago the nerves and muscles are still healing. He now has me scheduled for a video strobe though on 4/21/14 which makes me feel he isn't too sure of what he told me.I had a clear voice before but now feel very stressed out just trying to talk and still feel a tightening at the top and left side of my throat and always have a very hoarse and weak voice. I had the cervical fusion on May 23, 2014 and afterwards I could barely swallow water let alone pills for almost three days! I'm now 8 weeks post surgery and continue to have issues with swallowing depending on what I'm eating. My main frustration is with my voice. My work requires me to be on the phone at least six hours a day...and this past week was my first week back...even though my once lovely voice is now deep and hoarse. I feel the constriction in my throat which leads to headache and pain in the front of my neck. Needless to say, work isn't going so well. After surgery I was really angry with my surgeon as I did not feel properly advised of this complication!! I was told that my throat would be a little sore...so I bought a bag of Riccola throat drops..LOL, really??? My family,(who has been taking up the financial slack since the surgery....as well as my work place keep looking at me, (they look like a bullfrog blinking in a rainstorm)...waiting for me to "get back to work"!! I'm trying to not allow depression to slip in while I wonder if I will need to find a different kind of job...Grrr. I had surgery the same day and find myself betrayed, lied too, My life was destroyed by having a C6-C7 fusion. vocal cord paralized, can not breath, anciety, can not sleep and find myself alone. Worst of it is that I took good care of my body to last til age 100 if possible and now I am scare. Like you need to talk and now have to ask others for help. 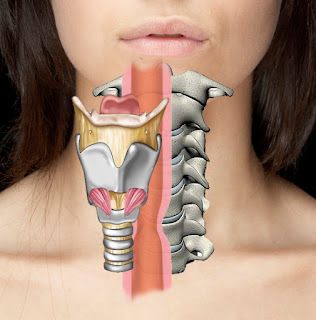 I have had increasing choking on food, loss of singing and speaking voice, and raspy hoarseness since my 2008 C-5/C-6 neck fusion, titanium pin/plate implant. I am worried sick about choking to death or worse, being fed through a feeding tube because I can no longer swallow my food or tablets. My barium swallow test last week shows a failure of motility--meaning instead of things going DOWN the esophagus they are being pushed up, causing stagnation and choking. It takes a lot of effort and work to swallow meat, bread anything thick or dry. I will have to stop eating these foods clearly. I am frightened and although I don't have reflux, it causes burping, indigestion and food to come back up in my throat whole. I am only 60, in other wise good and fit health, and hope to find help through therapy or something. Praying for good outcome and not a death from choking---cant imagine anything worse. Found other reasons for this problem such as head or brain injury, that you don't even realize you could have had, complications from mild stroke, and/or early onset signs of dementia. Great! so I will choke to death AND lose my mind! Thank you Ms. Charles, for your post. I am four days post-surgery after having my C5/6 & C6/7 fused. I initially searched to see why my voice changed. It's awful, but after seeing the above video, it makes sense and I was glad to have seen it. You make good points on chewing and I'm glad I saw that. Oddly enough, we did have rice for dinner last night so I think I'll take that off my plate for a while! I did notice that I had to cut my food smaller....actually my wife was good enough to cut it small for me but I was weary of the rice. I wish you well in your recovery. I had surgery 5 weeks ago and still have very little voice. When I speak, I run out of air and when I sneeze, it is all air. I work as a technology trainer and need my voice to do my job. I can't project my voice at all and some letters/words come out as air and are hard to understand. I had steroids to help but they did nothing. I'm hoping something changes. Like most of you I too have C4/5/6 done in May this year. C6/7 2001. My voice has not returned yet either, hoping it will as my career as a musician will be a bit buggered. Did anyone else have a cough caused by what feels like a little critter wriggling in your throat?? The up side of this surgery is less symptoms and no headaches thankfully. I am a classically trained singer and make my living from singing... I had C6-C7 fusion in 2006. It has been really stressful for me because since surgery I have had a cough with mucus (sometimes projectile mucus when coughing) and yes constant irritation in throat about level where anterior surgery was performed. I get migraine at the base of my head where it meets the back of neck. I get pain etc and at occasionally have breathing difficulties mainly in bed trying to sleep. (Very calm when this happens for the record. It's not an anxiety thing). I had nerves damaged during surgery and woke up with Horner's Syndrome. The cough and mucus and feeling of needing to clear my throat is the most stressful in some way because it is hindering my ability to make my living. Love to know what can be done about cough, mucus, feeling in throat. I had a fusion in march 2013..it went well...i had a real bad sinus infection and upper respiratory infection 2months ago. ..feel alot better ...but i still have a sore throat. ..made an appointment to see ent...has anyone else went through this...and i forgot to mention my lipnoid on the right side of my neck swolled up right above my cutt of surgery .has anyone went through this before? . Hello I had artificial disc put in C5-C6 October 2, 15. I too woke up with Horner's Syndrome. I have gone back to work a few hours a day, but after talking become very hoarse. I also have the cough and mucous. Just wondered how you were doing now. I am currently considering ACDF for C6-C7. I've been able to put it off for almost 12 years with chiropractic adjustments, exercise and steroid injections but it looks like I may have reached the end of the line putting band-aids on the problem. I sing professionally and also do voice over work. Damaging my voice is a big deal and after reading all the difficulties others have been through, frankly, I scared $h!tless. Does anyone have a word on any surgeon who takes extra care and has had success not to traumatizing a person's voice? have you experienced any issues with snoring and/or extreme dryness of the mouth during sleep? I am awaken every 2 hours or so due to the dryness. I ave dried a humidifier but doesn't really help. I also wake myself up with loud snoring now. Have you experienced similar issues? I just had C6-7 done November 4th. My voice is still not back fully. It makes me exhausted by the end of the day with all the air needed to speak. My follow up appointment was Monday. The doctor asked me if my hoarseness was new after surgery?! This made me nervous. I am glad to read it may just need more time. I was told it would be temporary, a couple weeks, if at all. Feeling left out of conversations. The good news? When telemarketers call, the systems can't understand me and hang up! I was also told I didn't need an ENT doctor until my next visit, in 3 months, if it is not better. My fingers are crossed! I had a tumor removed from c3 and c23&4 fused January 2015. I am a singer and I still can't hit high notes. My voice gets tired very easy. Sometimes it just completely cuts out when I try to hit a high note. Low notes are fine. It feels like I am just now starting to get the feeling back in the front of my neck. Maybe I'm still healing? I hope so. I had the surgery 3/9/16 and it was a relatively easy recovery. Have had the cervical on continually (7 weeks now) and my voice is a hoarse whisper, and no one specified how long this will last? I have the same issue. I had a disk removed and plate place on C4 and C5 in April. I can't make high voices when playing with my kids. I had a c567 done may 26 of 2016 5 weeks in this im still hoarse.i go back to dr for my 6 week check up n goung to let him know ive had some complacations with swallowing n me sounding like a bull frog stuck in my throat .it seems as when im talking its like i have to yell when i talk .its bugging me n im wondering what to do. Mellisa, my vocal cord was paralyzed...from the same operation. When you go, have the surgeon refer you to an ear, nose and throat specialist..I went in for a short procedure to enlarge my vocal cord with a Botox type of injection....my voice is returned to normal. Good luck! Had a 3 level ACDF. Originally I had the surgery on June 1,2016. On October 1, 2016, I ended up in the ER. I spiked a fever of 103.7 and had to brace myself against a wall to swallow my own spit. I'd said several times that I was having major issues swallowing and the pain was more than I could handle. Which my dr wrote me a prescription for more pain medication and scheduled a follow up appt. it turns out that I had an abscess around my esophagus from Three punctures done during surgery with an instrument. I spent time in ICU and then in the hospital for 19 days. The first time I was in for 5 days and then in again for an infection at the sight and the final stay was 19 days. I've been put on a feeding tube with nothing (food or drink) down my throat. I'm down 27 lbs and have gone for the past month, every day since I got out, for IV antibiotics thru my Pik line. I still have one remaining hole and was scheduled for surgery to repair and put a muscle flap over, but they changed their mind and right now I'm in a holding pattern. They also had to remove the three plates when they removed the abscess, because of the infection. I'm a 48 year old female. I've always been healthy, active and I'm one of 23 kids, so life has been blessed and full. I have a daughter graduating from college and a 17 year old son that's a junior in high school. I had a retail store for 3 1/2 years I was forced to close. Things usually don't beat me down but this experience has taken all the wind out of my sails. Having trouble with my feeding tube and I've been at the doctors office for four hours. He's doing an X-ray and seeing what's wrong. I'm kind of at a loss at this point. It seems like no one knows how to fix it for sure and in the meantime my quality of life has gone from a ten to about a two. I realize swallowing issues are common after this surgery but it should always be considered that it's more than just a common symptom. Had discs C5 & C6 removed, cadaver matter inserted, plate & screws. Also had 2 rods inserted in back of neck. Only had 3 days with minor difficulty in swallowing and no voice loss.This was done 11/10/16. Go back to work 1/9/17.Soft collar is my New Years day present. Feel great! I'm 2 weeks post op from a C2/C3, C3/C4, and C4/C5 procedure, and was told by my surgeon it was extremely bad and all bone on bone. It took 6 hrs, and I have absolutely no voice at all. It hasn't gotten any better in these 2 weeks, and I'm told it may not come back! Is this possible? The sensors to the gentleman whose lost his voice after the surgery. The same happened to me and three weeks after losing my voice I went to a surgeon has an outpatient and she performed a very minor operation to inject the non-working vocal cord with a Botox type medicine to plump up that non-working vocal cord...within the next 4 hours I had my voice back and it's been fine for over a year....good luck! did your swallowing ever get better? My mom also had 3 level acdf and went on a feeding tube. We are now 3 months post op and she is still having a hard time managing her own secretions and saliva. Were about to go see the surgeon for the 3 months following up. Beyond upset for this complication after surgery. did your swallowing get better? my mom also went on a feeding tube after 3 level acdf surgery. I had the surgery 19 months ago and I still have hoarness and am no longer able to sing. I seen a speech pathologist but to no avail. The ENT is sending me to a speech Doctor still no appointment yet. The V.A. has done a horrible job getting me help. Anyone else have problems this long after surgery? Look into insurance for your voice if it is making you some money insurance might pay you for some lose of income.